Today’s FoodTruckr Hero is anything but ordinary, and we couldn’t be more excited to share their story with you. Dark Side of the Moo out of Hoboken, NJ, has a mission to put their own unique spin on classic American favorites like burgers, sandwiches, and sausages. How do they take these tried and true standards and give them a major twist? By adding in ingredients ranging from wild boar to elk to kangaroo. Hailed as an “exotic meat emporium,” Dark Side of the Moo offers culinary adventures that you’d be hard-pressed to find in even the fanciest of restaurants—and surprisingly, everything on their menu is less than $8. And as if getting to try a unique dish like Pheasant with Cognac or Smoke Alligator with Sauce Piquante wasn’t already worth the money, each item is also topped with savory ingredients like apple brandy, juniper berries, smoked jalapenos, and fennel. This incredibly unique truck got a quick start after Hurricane Sandy hit their town hard and food trucks took to the streets to feed local residents. They haven’t looked back since, quickly developing a full menu of ethically sourced exotic meats that are high quality without the high price tag. Of course, these FoodTruckrs know that while many customers are hungry for their unique spin on things, not everyone has such adventurous friends. They also offer a selection of delicious, traditional options like a BBQ Bacon Cheeseburger, a Pulled Pork Sandwich, and Cajun-Style French Fries. 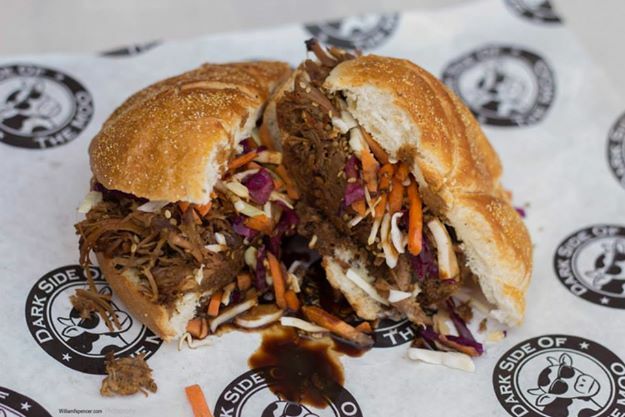 You’ve gotta love a food truck that serves gourmet meals without the gourmet price tag, and Dark Side of the Moo has a big fanbase to prove it. With a slew of positive Yelp reviews and a growing Twitter following, these FoodTruckrs have what it takes to keep speeding along the highway of food truck success. Keep up the great work!